A BRITISH mum has been left raging after an airline refused to stop selling nuts despite her son having an allergy to the snacks. 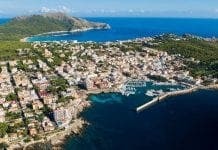 Akilah Robertson,30, was left stuck in Mallorca with no refund after walking off a Eurowings flight to London over fears for her two-year-old son’s safety. Tot Jamil was rushed to hospital with a severe reaction after eating nuts a few months ago and his mother feared an in-air anaphylactic attack, which can kill victims. “’I am angry at the way Eurowings treated us. It was really awful,” she said. “Jamil has had an allergic attack before and I didn’t want it to happen again. Robertson, from London, had flown to Mallorca with Ryanair, whose staff agreed to her requests. 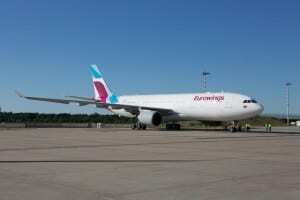 German company Eurowings refused outright however, and she was forced to buy Easyjet flights back to London at a cost of 750 euros. “We had a really good holiday but all that relaxation ended at the airport,” she said. A spokesperson for Eurowings apologised to the Robertsons, but said that a ban on nuts simply wasn’t possible. Does she expect shops and supermarkets to clear their shelves of everything containing nuts, when they go shopping? Sorry your comments are spoken from people who have not experienced a real bad allergy, my bother has one for curry, if in a restaurant someone has a curry he has to walk out, so don’t assume that everyone is on the con. Yes I am very proud to be British. Items in supermarkets are sealed so no problem. David Stringer agree with your comment 100% Maybe this is another scam to receive compensation? Brits are doing very well with the my family suffered with sickness whilst on holiday and as it was everything included in the Hotel it must be your fault. Claim with the help of bogus law firms and insurance agents to get compensation from the Hotel. Mallorca and Tenerife are the worst places that are suffering this scam and are looking at not offering Brits all included holidays. Doesn’t make you just proud to be British!!!! I have medical confirmation that I am allergic to evergreen trees. Will everyone please stop celebrating Christmas. Sorry your comments are spoken from people who have not experienced a real bad allergy, my bother has one for curry, if in a restaurant someone has a curry he has to walk out, so don’t assume that everyone is on the con. Yes I am very proud to be British. Just a thought but why didnt she just fly with Ryanair both ways? Jack Daww – You are really an insensitive, racist fool, a disgrace to all that has been great about real, not illusionary – English culture. Dear chas, would you like to step down from your high horse of self-righteousness and look a bit at how things are working now? Stereotypes do not appear “just because”, they do appear because certain group of people are behaving in a certain way more often than any other group. And stating something about the case that looks like a scam, does not make that person insensitive or racist. Anyway, everyone is entitled to their opinion after all. In democracies people give others the benefit of the doubt. Jack Daww’s statement… “i dont think the names Akilah and Jamil are typically British names” is if not racist, ignorantly L’l Britain, and should be called out for what it is ignorant, insensitive remarks. Yes everyone is entitled to an opinion, as silly, bigoted and uninformed as they may be. do you honestly think they are British you fool….dont be afraid to speak up and speak your mind……its because of these type of people and people like you that let these type of people get away with what they do…..its time to stand up…..dont be a coward chas…..!!!!!! 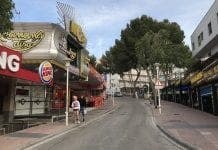 The “the Nigels, Simons, Barnabys, Archies, etc.” involved in scams, rugs, gambling, sexual assault in Southern Spain are British. So do we assume that people with names like that are all bad? deviating from the story is deviating from your your beliefs……..you fight a very shallow argument…….but then again you have a very shallow soul and very LIMITED knowledge….you try change the story to suit your pathetic argument……..grow some balls man…!!!!! STAND UP FOR WHATS RIGHT…!! !